By this time, we're all anticipating the upcoming spring collections coming to the NC Mall. We're expecting an array of Negg-colored wigs, soft baby blue button downs, and floral patterns to die for. The winter collections have been worn out and we're ready to step into something new. In preparation of the upcoming warmer weather, let's take a look at the greatest Spring fashions from years past, designed by the greatest artists and fashionistas in the business! 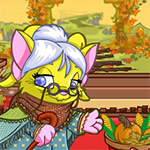 As another year of Charity Corner fades away and bank accounts and buying frenzies settle I believe it is important to reflect upon the valuable, timeless lessons Granny Hopbobbin has once again taught so many of us through the gifts of charity and giving.